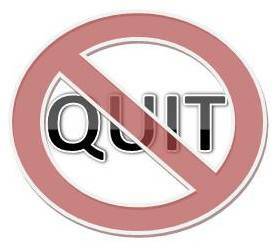 Never Quit….Unless You Have To…. I Mentioned in my last email during the week, that I went and saw ‘The Life of PI 3D’ last weekend with my girlfriend. Personally I thought it was a great film, and if you have the chance, then I would recommend you go and watch it. Now there are a few messages hidden in the film, but the one I’m going to talk about today is: not giving up. Without giving away too much of the film I’ll give you a quick background on the story for those of you that haven’t seen the film. The film is based around a boy by the name of PI (pronounced pie). The story tells the mental and physical struggles PI goes through while in the middle of the ocean in a life boat after the ship he and he family were on sinks. Not only must he survive the tough conditions of the ocean, without much food or water but he must do it while he shares the boat with a tiger. I know it’s just a film, and the story starts with PI practicing different religions but as I came out of the cinema it made me think about the real life situations people have gone through after their ship has sunk in the middle of the ocean. There have been countless stories of ships sinking in the middle of the ocean, where people have gone missing for years – yet they still survive. Take fat loss for an example. Plenty of times here on this blog I have mentioned that if you’re really serious about burning fat then you should ditch the traditional long cardio and start using resistance exercises. This could be low intensity supersets, medium intensity ladder workouts or even high intensity circuit workouts. Now say you didn’t know that important piece of information – all you knew was in order for you to burn fat you must run as much as you possibly can. Now add in the ‘Quitters never win and winners never quit’ attitude. How much disservice would you be doing to yourself?! Yours not only spending boat loads of your precious time working out, but your also doing it and not getting the results you want. It’s time to quit doing cardio – and change it to something like high intensity circuit training. But now instead of doing something that isn’t working very well you’ve replaced it with something that not only takes a fraction of the time to complete but you’ll be getting BETTER results. So yeah, you have quit, but you’ve also progressed. You see knowing when to quit and what angle to come in at the next time round is really the key to this. Quitting doesn’t mean you have to give up altogether.